The vice bulls had a titillating time on Main Street tonight as they swooped down on the scantily-clad hot mammas of “Hot Mamma” at the Follies Theater, grabbing twenty-seven of the tiny-leaf’d gals and loading them into paddy wagons. Also arrested were twelve chorus men of the Hot Mamma show; further pinched were four tattooed women in their work clothes, and of course Ili Ili, the untamed tree-climbing South African pygmy (this last group in violation of Ordinance 6859, aka barking a show on the sidewalk, outside the Dreamland Palace at 539 South Main). 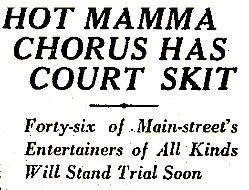 It’s a good thing counsel made a point of selecting an all-male jury, as the vivid descriptions of indecent dances, songs, jokes and costumes brought blushes to the faces of jurors, court spectators and court attaches during the trial. The highlight of the trial was Rev. 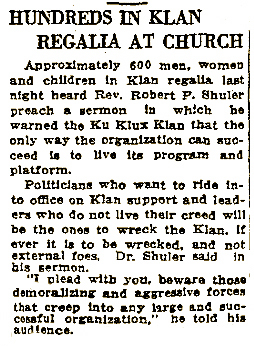 Shuler himself, who read from his copious, filthy notes, which recounted a lewd performance between two girls playing the parts of deserted wives looking for their husbands in the barroom of a ship. 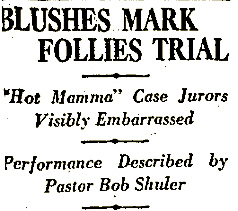 And Shuler’s dead-on imitation of a “licentious smile” which he asserted to be part of the dancers’ repertoire brought such an outburst from the crowd of spectators (and the Hot Mamma girls) that the bailiff threatened to clear the courtroom. Preacher Briegleb minced no words: “They didn’t have enough clothes on to flag a handcar,” said he, and described the activities of the chorus as “a moving sea of contortions of all that was low and vile.” Defense counsel asked that the good minister confine himself to the facts, but what fun is that? In the dancers’ defense, Dorothy Walton, the blonde “Cleopatra” of the play, described her dancing as being “combinations of modern and classical steps” in which, she admitted, did in fact move every part of her body. Needless to say, the Follies soldiered on. 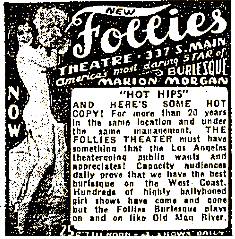 It was remodeled by S. Charles Lee in the 1930s, and thereafter saw many decades of shimmy-shammyin’ by Lili St. Cyr, Ann Corio and Betty “Ball of Fire” Rowland. 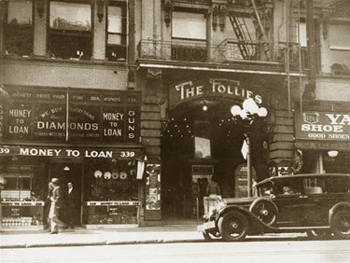 Eventually girlesque went the way of vaudeville, and the Follies became a skin-flick house. 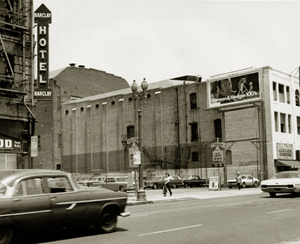 In 1968 Eleanor Chambers, executive assistant to Mayor Yorty, led the fight to have the Los Angeles Cultural Heritage Board add the Follies to its list of culturally significant buildings (who had just added a theater and something art deco). 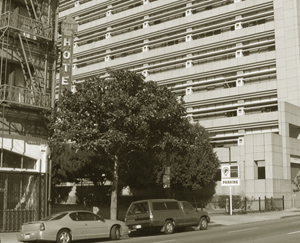 The board nixed that idea as beneath them (rejecting the Burbank/Burlesk at 548 South Main as well).